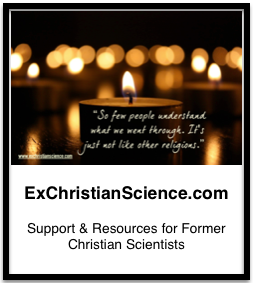 This post is being done in collaboration with my fellow ex-Christian Scientist blogger at Emerging Gently. We have also posed these same questions to other ex-Christian Scientists. Their answers appear in a series of posts on The Ex-Christian Scientist*. 1) Why did you attend Principia? I had to get away from the toxic culture perpetuated by my high school, there were over 4000 students, and I wanted/needed a change. I had been brutally bullied through middle, felt largely overlooked (but not in a good way) in high school, and wanted a fresh start. No one else from my high school had ever gone to Principia so it seemed unlikely there would be anyone I knew, no preconceived notions about who I was, etc. Principia was the only college I applied to, and I was fortunate to get really good funding from a variety of sources (not just loans from the college), in exchange for maintaining a 2.5-3.0 (or higher) GPA, and a yearly thank-you note. 2) Did your experiences at Principia impact/influence your views of CS? Yes! The spectrum of what qualifies as “practicing” “Christian Science” varies wildly. The way Christian Science is put to work at Principia makes me particularly uncomfortable (see my negative experience below). 3) If you had a do-over would you attend Principia again? Why/why not? This is a hard one, I met my future husband at Prin — I was not looking for one, in fact I was pretty convinced I was never going to marry a “good little CS boy.” I’m happily married, and I’m unlikely to have met him another way. Would I go advise my 18-year-old self not to apply? No. I like where my life ended up, even if the path to get here was a bit trying at times. 4) Would you recommend Principia to a young CS? Positive – I made some truly wonderful friends, I enjoyed the (false) sense of security knowing I was in (what I thought was) a like-minded community, I had travel experiences I would not have had otherwise, and I learned a lot about myself (both good and bad). Reading over this now, I am horrified by my RC and professors non-reaction to my condition, my face was obviously badly swollen on one side, and I was in a tremendous amount of pain. When I did show up to take my final my professor didn’t say anything, and seemed irritated that I’d missed the scheduled time. The Cox Cottage nurses were useless. I asked for something to lance the abscess in my gums to relive the pressure, but they looked at me like I had two heads and I was informed “we don’t do that here.” I spent a night alone in my room hallucinating with a high fever and struggling to breathe as the infection crept down the side of my jaw and into my neck. It could have been potentially fatal, crushing my windpipe, eventually the situation did resolve itself (the abscess ruptured) and the puss drained. I don’t think I have ever been so glad to get to a dentist’s office as I felt after that particular experience. The best college you can get into? Not Principia! In the interest of full disclosure, it should be noted that the author of this blog is also an editor/developer of The Ex-Christian Scientist website. Horrible, simply horribly horrifically horrible! I can relate. The issue that completely severed my ties to CS was a similar thing except it was ovarian and I spent 10 days in hospital after a near death experience! Wherever there is swelling and infection, there is danger. Principia was very irresponsible. CS nurses are simply not trained for such situations, and while I may have legally been an adult (I was in my very early 20s), I still needed guidance (and medical care!) and they dropped the ball. I’m very fortunate that it was near a school break, and I was able to get home and get to a dentist ASAP, I’m not sure what I would have done mid-quarter!